Register Log In ECN Forum Forums Photos for General Discussion I took a pic- And everyone went home! On May 5th, I went to the jobsite ... for me, a simple air conditioner hook-up. Some guys were remodeling an office, and I had to chuckle when I saw their "power center:"
Yup ... you see a 2-gang plastic "Romex" box. 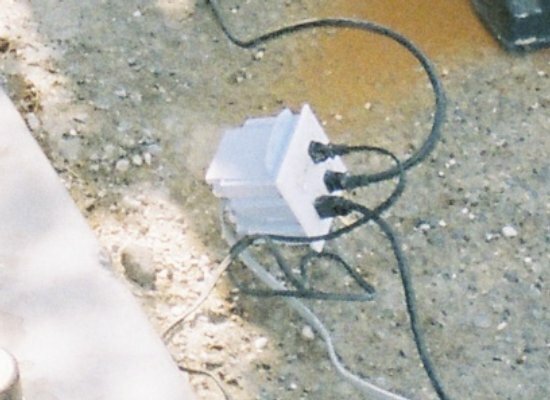 A standard molded-plug 'pigtail' supplies power to ordinary duplex receptacles, and a standard plastic coverplate. I have a few problems with this design. First of all, a pretty hefty 'triple tap' adapter for a standard cord costs about 1/4 what this contraption costs. There is no "strain relief" for that cord. That is, yank on the cord, and the force is transmitted to the connections. The little tab in the box does NOT provide reliable strain relief. 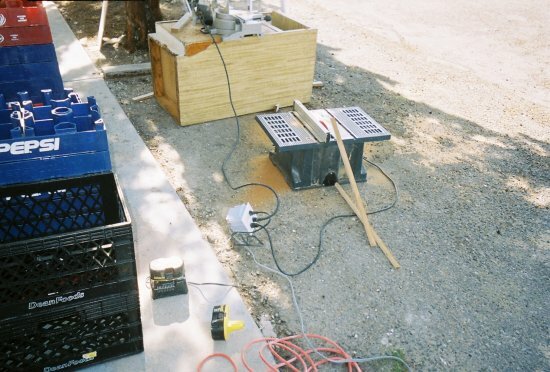 We can pretty much assume that dirt, etc., will freely enter the box through those tabs. The plastic boxes are also, especially in winter, pretty easily broken. For that matter, so is that cover plate. Finally, the GFI has managed to prove itself worthwhile - and affordable. Are you sure thats a cord pigtail to that box? Looks too flat to be a cord, more like UF cable. At least the box appears to be 'secured'. Looks like UF to me also, perhaps with a cord cap (male) on the end? Add to the list...no blade guard on the table saw. No, it's a standard 6 ft. pigtail with molded plug. These things are usually light gray in color, and have flat cords. Ah OK, thanks for clarifying John. Maybe they went home to grab a few more fearing you'd cut that one up. Who says carpenters can't do electrical work? After all, it's just a couple of wires. You know, "black to black, white to white... The green one is just extra, we won't be using that..."
I was at a seminar in Miami with Joe Tedesco years ago, when he decided to take some pictures of violations at the gasoline/convenience store nearby at lunch. The seminar resumed, only to be loudly interupted by the owner of the store. He insisted Joe hand over the evidence of whatever it was Joe took pictures of. You should-a seen Joe's face! Joe liked to call himself the "nail" when he was doing the IAEI road show. Did he nail the guy? AHH, So it is Universal. I thought that to be a Regional thing.